Published in magazines, never seen since / Now resurrected for pleasure intense / Versified episodes numbering four / Featuring Marco, and Horton and more! All of the entries in this follow-up to The Bippolo Seed and Other Lost Stories (2011) involve a certain amount of sharp dealing. 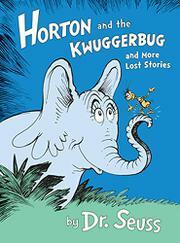 Horton carries a Kwuggerbug through crocodile-infested waters and up a steep mountain because “a deal is a deal”—and then is cheated out of his promised share of delicious Beezlenuts. Officer Pat heads off escalating, imagined disasters on Mulberry Street by clubbing a pesky gnat. Marco (originally met on that same Mulberry Street) concocts a baroque excuse for being late to school. In the closer, a smooth-talking Grinch (not the green sort) sells a gullible Hoobub a piece of string. In a lively introduction, uber-fan Charles D. Cohen (The Seuss, The Whole Seuss, and Nothing but the Seuss, 2002) provides publishing histories, places characters and settings in Seussian context, and offers insights into, for instance, the origin of “Grinch.” Along with predictably engaging wordplay—“He climbed. He grew dizzy. His ankles grew numb. / But he climbed and he climbed and he clum and he clum”—each tale features bright, crisply reproduced renditions of its original illustrations. Except for “The Hoobub and the Grinch,” which has been jammed into a single spread, the verses and pictures are laid out in spacious, visually appealing ways.